MANILA, Philippines — This year’s P3.757-trillion national budget may end up being vetoed in its entirety if it turns out to be problematic, President Duterte said yesterday. Duterte talked about the much-delayed spending bill while he was citing the need to have allies in the Senate during a campaign rally in Bacolod City. “The budget has just been submitted. I have to sign it once I return. I am still studying the budget (which was submitted to the) Office of the President. The Office of the President is not the budget,” the President said. “So, ang legal ko magbasa uli. Ngayon, pagka talagang tagilid ’yan (My legal team is reading it. Now, if it is problematic), I will outright veto the entire budget,” he added. Duterte noted that the House of Representatives and Senate have been bickering over the alleged insertions in the budget. “Pagka tagilid talaga (If it is really problematic), I will not hesitate to veto the entire budget. Eh, ’di pasensya tayong lahat (We just have to live with it),” he added. The General Appropriations Act will lapse into law on April 26. The passage of the spending bill was hampered by the mudslinging among lawmakers and between some House members and the budget department. A reenacted budget until April will bring down full-year economic growth to 6.1 to 6.3 percent, according to the National Economic and Development Authority. Economic growth is expected to slow down to 4.9 to 5.1 percent if the budget is enacted in August and to 4.2 to 4.9 percent if no new spending bill is passed this year. There will be no signing of this year’s budget program on Monday or before the Holy Week break, Malacañang said yesterday, withdrawing an earlier advisory. Asked about the status of the budget, presidential spokesman Salvador Panelo said President Duterte has decided to give the document a second look and defer its signing until after the Holy Week break. “Pinagaaralan nya (He’s studying it),” Panelo said. “It’s been calendared, but still being studied. Maybe after the Holy Week,” he said, referring to the possible signing schedule. He did not give an exact date. He said the supposed signing ceremony has been removed from Duterte’s schedule for next week. “They can bring it back, right? All his schedules are subject to change without prior notice,” the spokesman said. “I don’t want to speculate or guess. I will ask him when I see him,” he added. A Palace advisory released on Wednesday showed officers of the Senate and the House of Representatives led by Speaker Gloria Macapagal-Arroyo and Senate President Vicente Sotto III being invited to the signing ceremonies. Also invited were members of the House appropriations committee and the Senate finance committee chaired by Rep. Rolando Andaya Jr. of Camarines Sur and Sen. Loren Legarda, respectively. One of the controversies that hampered the budget process was the rift over moves to scrap the Road Board. The proposal reportedly triggered a quarrel between then budget secretary Benjamin Diokno and some lawmakers who accused him of inserting some P75 billion in the spending bill. Diokno, now the Bangko Sentral ng Pilipinas governor, has denied any wrongdoing. Last month, Duterte signed a law abolishing the Road Board, a body he described as a “milking cow” of corrupt officials. House and Senate leaders also accused each other of making last-minute amendments to the proposed budget. Meanwhile, Andaya said the House leadership will respect President Duterte’s exercise of his veto power on the proposed P3.757-trillion national budget for 2019. “We respect the veto power of the President, and we are convinced that he will exercise such authority for the benefit of the nation and of our people,” Andaya said. “We are confident that the Office of the President would consider these items in their review and find ways on how to restore them in the President’s veto message,” the senior administration lawmaker added. Andaya earlier accused senators of sabotaging the programs of Duterte, especially the Build, Build, Build program, after they allegedly removed unilaterally some P83 billion from the national budget. Senators said insertions made by some lawmakers in the budget after its ratification were unlawful. 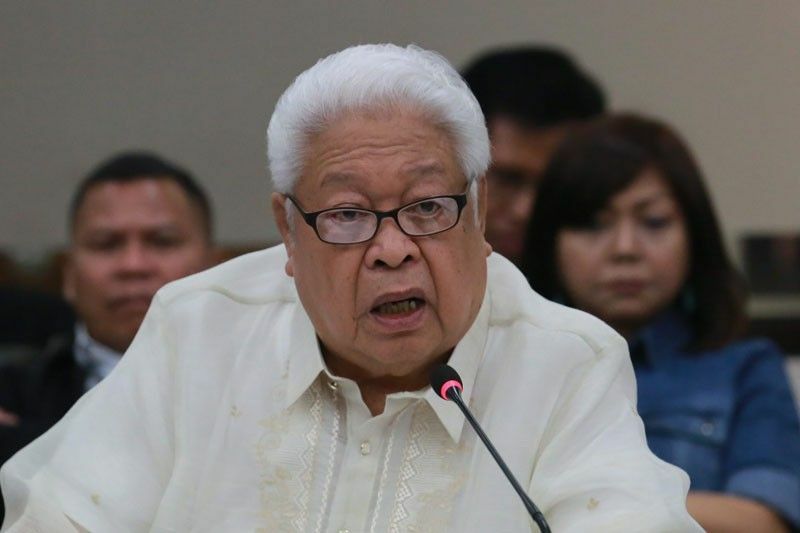 But opposition congressman Edcel Lagman said there was nothing unconstitutional about the adjustments made by congressmen. “The adjustments or realignments made by the House and the Senate after the ratification of the Bicameral Report are traditionally and legally authorized and do not violate the 1987 Constitution,” the Albay lawmaker said.